Unfortunately, there was no restaurant in Val Marie or anywhere within a 50-mile radius. We did find an old schoolhouse that had been turned into a coffee shop/museum/gallery that would be opening in 20 minutes so we decided to wait there. When the young woman who works at the coffee shop showed up, she had a service dog with her. Two encounters in two days. While she got the place open and got us our coffee she explained that she uses her dog for PTSD and is also helping the training process along. The dog was obviously very trained and she was a delightful young woman. We got talking about the Parcs Canada system and it turns out her father is the head veterinarian for the entire National Park system. 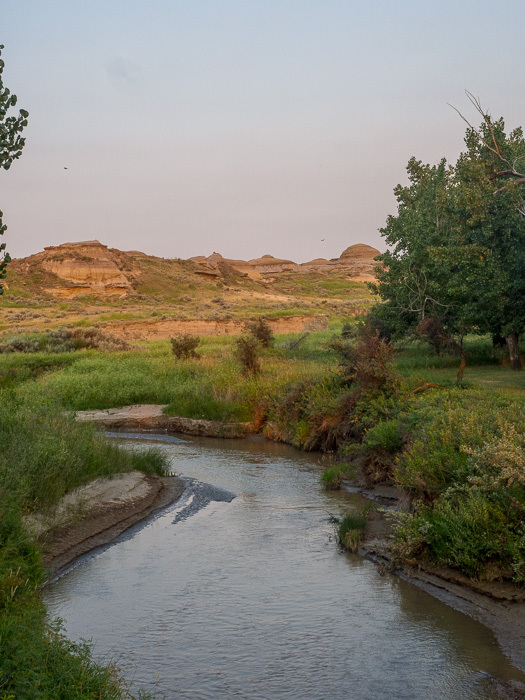 Our next stop was Dinosaur Provincial Park near Brooks, Alberta and we were keeping an eye on the wildfires that were out of control in many parts of British Columbia and Alberta. We felt confident that our route would keep us east and then north of the fires. Many major highways were closed and a lot of people had been evacuated. We drove through a lot of what appeared to be commercial farmland on remote and very bumpy roads. In fact, it was this stretch where we got the first (and so far, only) ding in the windshield. Finding a gas station in this remote area is a rarity so you stop when you see one - whether you need gas or not. In our case, the stop was in Cadillac, Saskatchewan... a tiny town with a gas station and not much else. I was just getting out of the van to start pumping when I noticed a guy wearing a Milwaukee Brewers t-shirt. Being the anti-social person that I am, I would have just made a mental note of it ("Huh - pretty random running into someone wearing a Milwaukee Brewers t-shirt here") but, of course, Jeff needed to talk with him. Turns out they are from New Berlin and were in the area visiting family. Small world. We continued on through the endless fields of bright yellow (never did figure out what the crop was) headed toward Dinosaur Provincial Park. 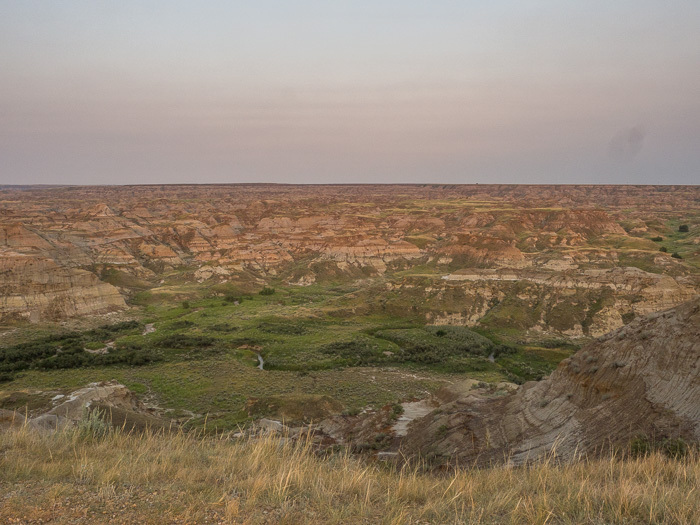 The park just suddenly appears as a huge hole of badlands in the middle of flat farmland and is really impressive. We could see right away that this one night stop was going to be extended by a night as there was much to see and great, accessible hiking in the area. 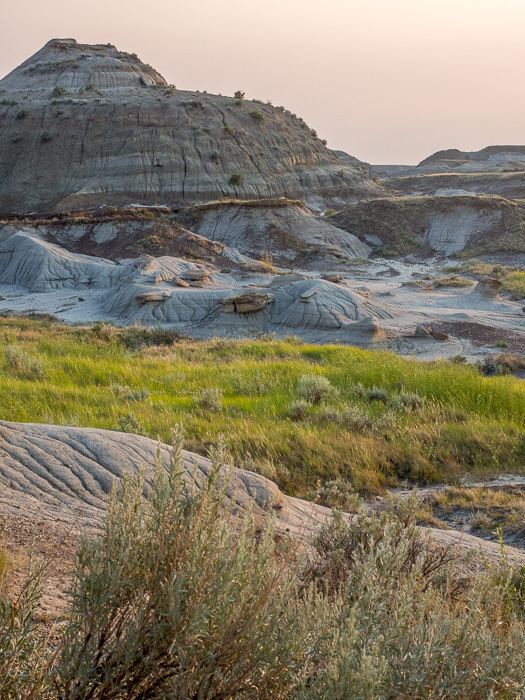 The park encompasses one of the richest fossil beds in the world and is still being excavated today. They have a couple of large fossils partially excavated and enclosed in glass structures for visitors to see, which is really cool. 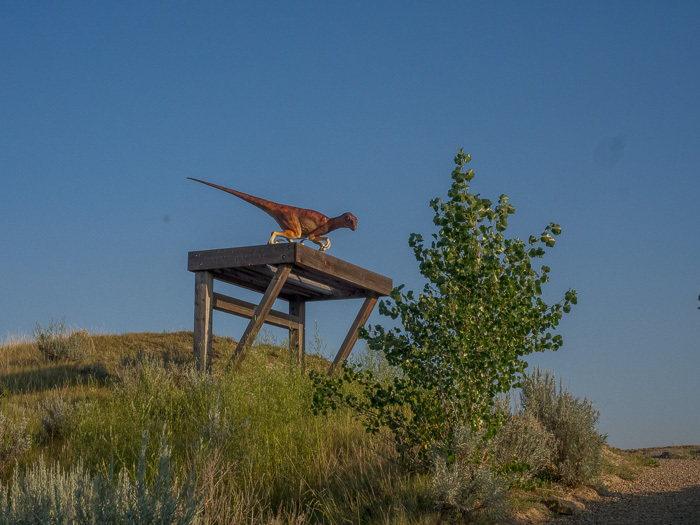 Apparently, it is common enough for a park guest to come upon a fossil that they have signs around telling you what you must do in that case. The evening of our second night in Dinosaur, we saw an unidentifiable mammal while out for a short hike. It definitely wasn't a cat (cougar) but seemed too big to be a coyote. It was too dog-like to be a deer so we settled on a wolf. Talking to the park rangers, they said it couldn't have been a wolf and must have been a large coyote. We remain unconvinced but have no photographic evidence so I guess we'll leave it at that. For the second time in three days, a Milwaukee Brewers logo made the scene. This time in the camp cafe at Dinosaur. We stopped in for some ice cream and noticed two little kids (maybe 8 and 11) both wearing baseball caps with the Brewer logo. We got talking to their dad and found out that he and his sons were on the tail end of a 3-week road trip to a bunch of baseball stadiums. They are actually from Edmonton but had gone as far east as Toronto and then down into the states to the northern US stadiums. Not surprisingly, Miller Park in Milwaukee was their favorite park. Headed from flat land to rocky mountains tomorrow!